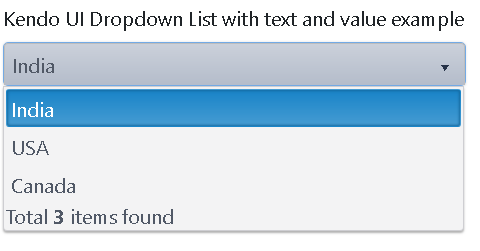 Kendo provided beautiful drop-down UI element. Kendo UI is rich in UX experience the following examples are based on kendo UI JQuery framework. 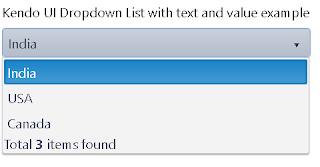 The dropdown widget can be initialized in many ways, I am going to show you the popular ways. In applications, there are the cases where we need to attach the data returned from rest apis. The data format can be json or jsonp format. To bind the remote data, Kendo UI framework provides Datasource object.